The State Championship Trophy for MS Tackle Rugby resides in Montgomery County. Saturday, the Dayton Northern Force Middle School team traveled to the Hall of Fame Youth Football Fields in Canton Ohio to participate in the Ohio State Tackle Championship. The Force had an undefeated regular season at 8-0 and are comprised of nine local middle schoolers (6 Northmont 8th graders, 2 Northmont 7th graders, and one Vandalia Butler 7th grader). They had two pool play games to dictate if they made it to the State Cup Championship Bracket and seeding. They then played Cincinnati Rebels, the #1 seed out of Cincy and a 2nd year team, and won 17-7. After pool play they finished with 9 points which ranked #2 out of 9 teams and had to face #3 Columbus Crusaders, the #1 team out of Columbus. They beat Columbus (a fourth year program they had beat 21-19 during the regular season) 34-10 in a run away. 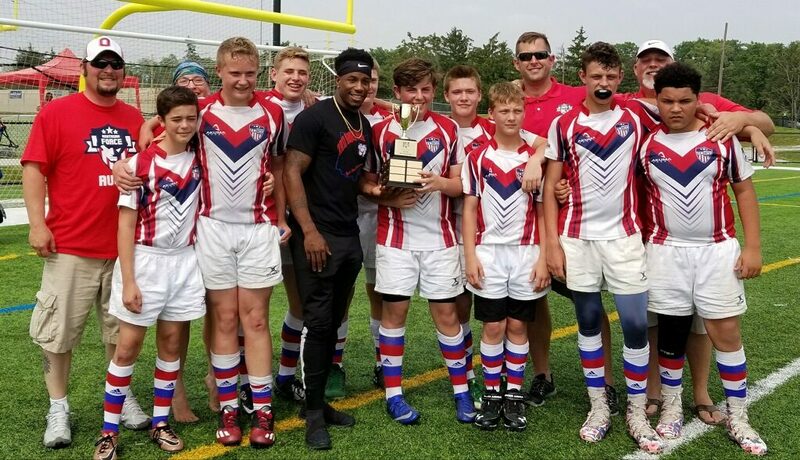 In the finals they were pitted against well established Cleveland Highlands (#1 seed from Cleveland that had won their two pool play matches 67-0 and 40-5) It wasn’t even a contest. The Force came out aggressive on defense and were up 15-0 at half and won the State Championship 20-5. The best part of this incredible journey was this was a first year tackle program. Many of these boys played flag rugby for 1-2 years but they had never tackled. These boys shocked RugbyOhio for sure.